Dessange International, the world’s leading operator in the high-end comprehensive beauty care market and owner of Fantastic Sams, Camille Albane and Dessange franchise brands, announced today the hiring of John Costanza as President and Chief Executive Officer of Dessange Group North America. Most recently, Costanza served as General Manager International Professional Division at Conair Corporation. Under his leadership, the company developed global professional division brands, namely Conair Professional, Babyliss, Satin Smooth, Aquage and Rusk. 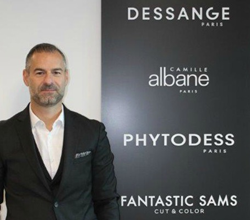 Bringing 22 years of extensive international and North American management experience, Costanza will lead Dessange Group North America’s expansion of its three salon franchise brands – now in nearly 2,000 locations worldwide. He will also be responsible for the U.S. distribution of the Phytodess hair care products. Costanza is a graduate of Harvard Business School. He has enjoyed significant successes while at Conair, L’Oreal USA, Sally Beauty Holding Canada and Joico Hair Care Laboratories. The three salon franchises – Fantastic Sams, with over 1,000 locations in North America; and the worldwide brands Camille Albane, an urban, upscale authentic French hair salon with 300 locations; and Dessange, the franchise leader in luxury hair salons and spas with more than 400 locations – enjoy a strategic position in the salon franchise industry. With more than 60 years of experience, Dessange International, the world’s leading operator in the high-end comprehensive beauty care market, is devoted to improving the overall well-being of each of its customers. The company boasts a worldwide network of nearly 2,000 salons, developing its own beauty care treatments, beauty institutes, and city-center spas, as well as its lines of makeup, accessories and hair, facial and body care products. To find out why Dessange International is the leading luxury and total beauty franchise and to learn more about franchise opportunities, visit dessangefranchise.com.